Led by its white mayor Mitch Landrieu, the city council of New Orleans on December 17th voted with a 6-1 majority to remove four statues honoring the confederacy. 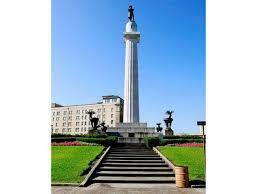 Foremost among them is the majestic Doric column upon which General Lee gazes north. It has stood at Lee Circle near the downtown since 1884. The campaign to remove confederate symbols sprang from the horrific murders of nine worshipers at a black church in Charleston, SC last June. The deranged shooter, a 21-year-old misfit, had been photographed with a rebel flag and said he wished to ignite a race war. In the ensuing months activists won the battle of public opinion, branding the confederate battle flag as a symbol of hate, essentially bringing its public display to an end. "What did Robert E. Lee do to merit his distinguished position? He fought for the enslavement of a people against our national army fighting for their freedom; killed more Americans than any opposing general in history; made no attempt to defend or protect this city; and even more absurdly, he never even set foot in Louisiana. In the heart of the most progressive and creative cultural city in America, why should we continue to commemorate this legacy?" New Orleans officialdom would be wise to reconsider their plan. Removing the Lee statue will be divisive. Millions of Americans--and not just southerners--hold Robert E. Lee in high esteem, both as a general and man of honor. While he served a detestable cause, in defeat Lee promoted reconciliation and opposed calls for rear guard guerrilla warfare against the union. Unlike confederate president Jefferson Davis who was imprisoned for two years, Lee was neither arrested nor charged with treason. He was greatly admired by his adversary Ulysses S. Grant. Civil War historian Bruce Catton called Grant and Lee "great Americans" and said their meeting at Appomattox, whose 150th anniversary was just observed, was "one of the great moments of American history." Catton wrote that Lee was a legend long before Appomattox and that for "thousands of tired, underfed, poorly clothed Confederate soldiers. Lee was the symbol of everything for which they had been willing to die." Few, I suspect, will regret the loss of statues of General P.G.T. Beauregard or Jefferson Davis (even though Davis's statue continues to stand in the U.S. Capitol). Lee, however, is different. There are hundreds of Lee memorials, schools and highways in his honor. Should they all go? Where does it stop? Should Washington, Jefferson, Madison and Monroe be repudiated because they were slaveholders? Many episodes of history are distasteful when judged by today's standards but that does not mean they should be airbrushed away. Let the advocates of change propose new monuments instead of erasing history they dislike. It is of course up to the citizens of New Orleans to determine the fate of statues in their city. But hopefully they will reconsider their plan to relegate General Lee to the garbage pile. Barry D. Wood is a Washington writer whose forbears fought for the union in the Civil War.